Orotti is a popular Rice Roti made with grated coconut from Kerala. This roti is rolled out with hand and is thicker in size. It is often served with spicy side dishes. While Ari Pathiri is rolled out with a rolling pin and is quite thin and soft, Orotti is thick and has freshly grated coconut added to the dough. Once you make the dough, you will have to pat it down to form thick rotis. As the ingredients are just rice flour, coconut, and salt, these rotis are served with spicy nonveg gravies. These thick rotis are popular in Kanyakumari and in Srilanka as well where it is called as Pol Roti., though the source I had adapted this had given with wheat flour. I adapted this recipe from here and its mentioned that apart from making it plain, one can make it spicy by add onions, green chilies, and cumin as well. So they also have sweet Orottis with sugar added. Well, I wanted to stick to savory version and enjoyed it with Peanut Chutney. This Kerala style of orotti is also called as Malabar orotti or thalasery orotti. I had a busy weekend as I had to complete most of the dishes for this week. Saturday dinner was 3 different rotis, so I had my plateful! All turned out very good as I knew. We mostly make Peanut Chutney as a side dish for Ragi Roti/Bajra Roti and decided to make it for this as well. Since I was making more than 1 and also it involved clicking, the rotis tend to become little tough. One needs to make it and have it hot or at least in a relatively short span. The other similar recipes based on rice flour are the Pathiris from Kerala, Angakar Roti from Chhattisgarh, Biyam Roti from Andhra, Ukkarisida Akki Rotti from Karnataka, trust me I have one more coming up! I will surely be repeating these as we love these different flour rotis. 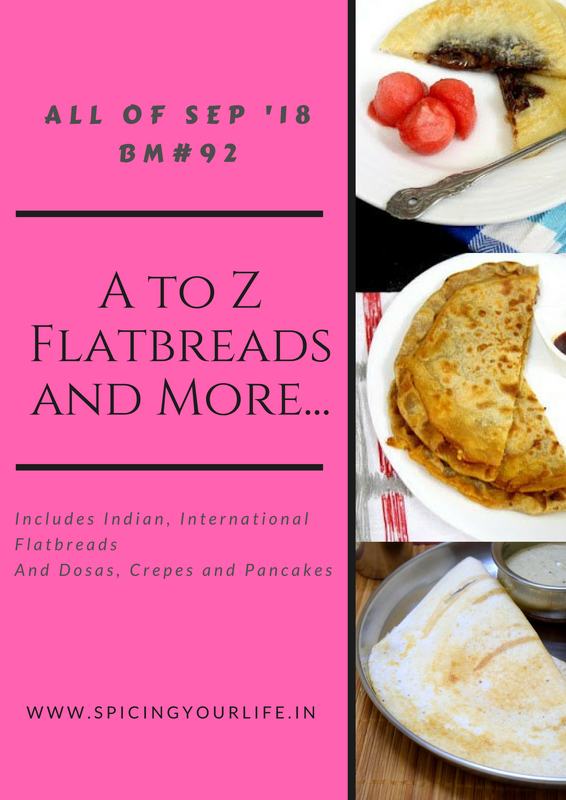 So for O, I have Orotti from Kerala, where Rice and Coconut mixed to become a roti, in the AtoZ Flatbread and more, where I am doing AtoZ Indian Flatbreads. If you want to know what I am doing for O in AtoZ Dosa Varieties, check out. Take the water in a saucepan, and bring to a boil. Reduce the heat and add the grated coconut and salt. Gradually add the rice flour while constantly mixing with a wooden spoon. When the rice flour thickens and forms a mass, switch off. Let the mixture be covered for 5 minutes. I made only half the recipe and hence add the hot water to the bowl with rice flour. After about 5 minutes, the mixture would be warm enough to handle with bare hands. You need to knead the dough when the mixture is warm. Continue kneading the dough till it is smooth. If required wet your palms with water while kneading to make it easier. Once the dough is smooth, pinch out equal balls and roll between your palms, then pat it down to 6 inch disc. These rotis can’t be rolled out as regular rotis. You can use a plastic sheet to help you remove the rolled out discs. Heat a pan and place the rolled out roti. Drizzle some oil, cover with a lid and cook for about 2 minutes on one side. Flip the orotti to cook the other side for another minute or so. There will be tiny brown spots that appear on the cooked side. These rotis can't be rolled out as regular rotis. You can use a plastic sheet to help you remove the rolled out discs. Coconut and rice flour roti sounds interesting . I am sure if these are consumed right away the texture and flavor would be awesome , I would love ve to try the spicy version . Your dinner sounds so yum..with three rotis, that is a feast! And this orotti with coconut sounds so good…I have to try this soon! Bookmarking! Looks like a prefect gulten free rotis to have with some flavourful curries. Orotti looks prefect and delicious. Lovely find Valli.I have tried pol roti long back and loved it. Cant wait to give a try to this rotis soon. I made pol roti recently, but with maida. This version of using rice flour and coconut is really good. Any dish with fresh coconut tastes amazing. When paired with peanut chutney this must have tasted so yum.. Very interesting. I have to try this rice flour-coconut combination to figure out how the flavor comes through. Bookmarked for later. An interesting version of a rice roti. Adding coconut must have made it taste awesome.I’d love to try it and would add onion and jeera. Addinf coconut in hot water is a complete different procedure for me , I thought you will be adding it at the end. Looks different and interesting, I bet it would be very soft and so yummy to taste. Very interesting and tasty roti recipe which made with rice and coconut. I’m yet to try rice flour roti. This Orotti with coconut added to it must be a delicious flatbread. Could it be made with desiccated coconut? This is a great gluten free option. I made Pol roti for this marathon and loved the flavor of coconut in the roti. This looks very interesting with rice flour. fabulous orotti recipe. precooked dough as I noticed in google makes very soft and delicious rotis. I wanted to try but dropped the idea. was skeptical about making dough using hot water. loved this orotti. Wow,you have so many versions of dosa with Rice flour from different parts of the country! Yes cooking and clicking many recipes on one day is tough and by the time we savor those, the texture changes!